Sixuan Wang, Gabriel Wainer, Rhys Goldstein, and Azam Khan. 2013. Solutions for scalability in building information modeling and simulation-based design. In Proceedings of the Symposium on Simulation for Architecture & Urban Design (SimAUD '13). Society for Computer Simulation International, San Diego, CA, USA, , Article 7 , 8 pages. 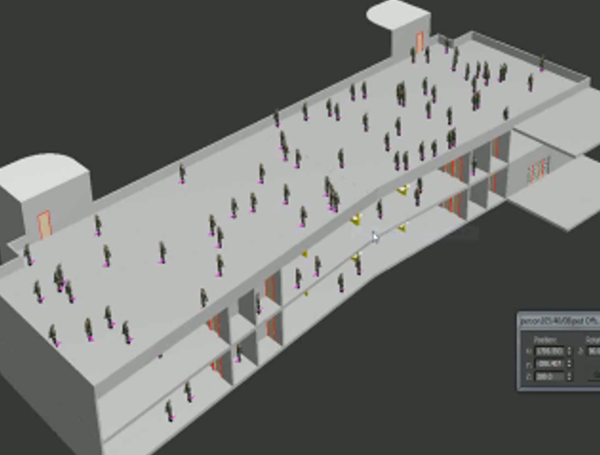 Simulation-based design can enable a number of advanced architectural and engineering applications such as energy modeling, occupant behavior prediction, or structural integrity analysis. To help make simulation-based design practical, scalability in terms of data and computation is needed. By using a Model-Driven Architecture (MDA) approach together with the RISE (RESTful Interoperability Simulation Environment) web interface, a generic scalable simulation design framework is presented. In our system, Building Information Modeling (BIM) data is represented in the Industry Foundation Classes (IFC) open standard from which Domain Specific Models (DSM) may be extracted for particular applications. The open RISE interface to a DEVS (Discrete Event System Specification) simulation provides computational scalability. We present a case study in which our system is applied to an evacuation model of a multi-floor building. We also show a 3D visualization of the simulation results to support further decision making. By enabling designers to extract information automatically from IFC and run simulations remotely, this kind of scalable system makes simulation a viable part of the design process.